A brilliant and courageous doctor reveals, in gripping accounts of true cases, the power and limits of modern medicine. Sometimes in medicine the only way to know what is truly going on in a patient is to operate, to look inside with one's own eyes. This book is exploratory surgery on medicine itself, laying bare a science not in its idealized form but as it actually is -- complicated, perplexing, and profoundly human. Atul Gawande offers an unflinching view from the scalpel's edge, where science is ambiguous, information is limited, the stakes are high, yet decisions must be made. In dramatic and revealing stories of patients and doctors, he explores how deadly mistakes occur and why good surgeons go bad. He also shows us what happens when medicine comes up against the inexplicable: an architect with incapacitating back pain for which there is no physical cause; a young woman with nausea that won't go away; a television newscaster whose blushing is so severe that she cannot do her job. Gawande offers a richly detailed portrait of the people and the science, even as he tackles the paradoxes and imperfections inherent in caring for human lives. At once tough-minded and humane, Complications is a new kind of medical writing, nuanced and lucid, unafraid to confront the conflicts and uncertainties that lie at the heart of modern medicine, yet always alive to the possibilities of wisdom in this extraordinary endeavor. 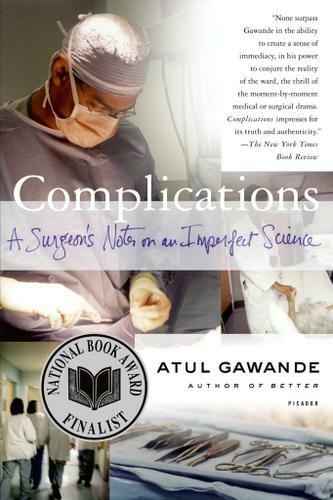 Complications is a 2002 National Book Award Finalist for Nonfiction.